The Employee Value Proposition (EVP) is a set of values and benefits that are offered to our staff in return for the hard work they do. Delivering on the EVP reduces staff turnover and makes Digital 22 an attractive place to work. Here’s why we made an EVP and what it means for the team and us. Why Do We Have an EVP? Digital 22 was founded because we weren’t happy with how things were done in the corporate world. Since then, we’ve always been committed to offering our team the best possible working experience. By cultivating a fantastic working environment, we make it easier for our teams to do their work - which is a win-win for both parties. We want our staff to love working here so that they want to do their best and progress within the company. The aim is for them to go home and tell their friends and family members about what a fantastic place to work Digital 22 is. So, when we need to hire new talent, they come to us, rather than the other way around. Early finish every Friday and a 35.5 hour working week. Every single Friday, we finish early at 3pm. Our working week is much lower than the national average, giving us plenty of time to socialise outside of work before heading home. We work on the site of a brewery and we don’t need much persuading to try some of the latest creations. 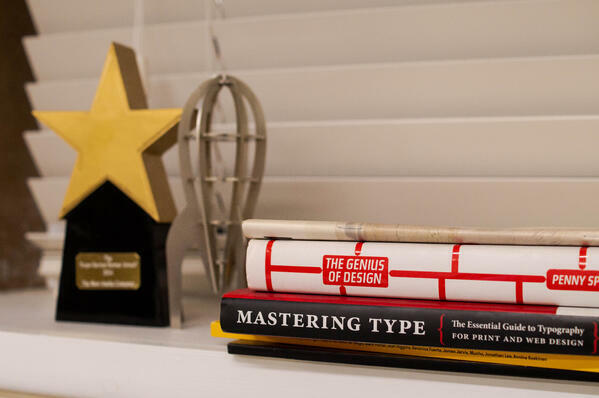 Each month we vote for on awards that recognise two outstanding team members who've shown that they've gone above and beyond when it comes to our core values. 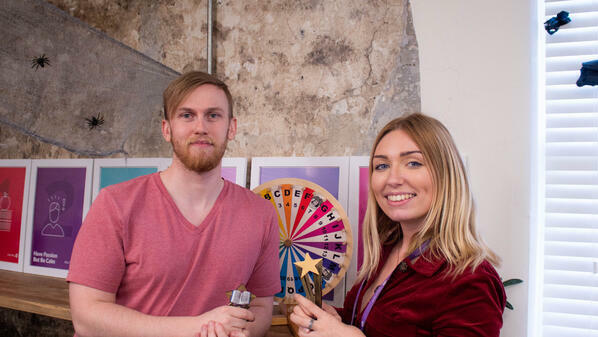 The two winners get to spin the prize wheel where they can win anything from a team lunch to £500. We follow the EOS business plan and have weekly L10 meetings within our teams and at a management level. It’s an opportunity to address challenges we’re facing and discuss ways of improving as an agency. We know that at some agencies, it’s easy to feel like your voice isn’t heard. That’s why we hold weekly anonymous NPS surveys to give staff the opportunity to rate their week and raise any challenges they’re currently facing. These results are used by management within their L10 meetings to help them to make decisions. Access to educational materials, training course attendance and personal development plans. One of our core values is always being hungry to learn. To assist with this, we make sure everyone has access to educational materials and a personalised training plan. We’ve allocated some of our budget to pay for staff to attend relevant training courses in the UK. Each year, we also take some of the team to the INBOUND conference in Boston, USA to get a hands-on first look at the latest HubSpot updates. Full transparency across the business. We know how frustrating it can be when the management team at an agency makes important decisions without consulting or explaining them to you. It can make you feel as though your opinion isn’t valued and that you’re dispensable. We’re always open about where the company is heading and what our goals are. Our staff are the first to know about business decisions and we encourage questions. Regular work and social events. Two of our core values are building strong relationships and helping clients and each other to grow. The best way to do this is with regular work outings and themed office days. It might be a pub quiz, a trip to the races or just a charity bake sale. Whatever the event, it’s an opportunity for everyone to get involved and have well-deserved fun. Supportive HR department and leadership team. Another of Digital 22’s core values is to be passionate but calm. We want staff to care about their work without letting stress affect their life. We have a supportive HR department that’s on hand to offer support and guidance whenever needed. These are just some of the items on our EVP and we’re always looking for more ways to make Digital 22 a great place to be. We encourage any agency to create their own EVP as it improves staff’s working environment which helps with productivity. Five-a-side football, a free pool table and so much cake. Each week, we head over to the local leisure centre for a 'friendly' game of five-a-side. If football's not your thing, then there's a free pool table and games consoles for you to enjoy. Plus, there's cake. Literally, there's always cake. Birthdays? charity events? you name it - there's cake. An extra day's paid holiday per year and pension contribution. For every year you work here, you'll earn an extra day's annual leave. Plus, we offer pension contributions that are three times the minimum requirement. 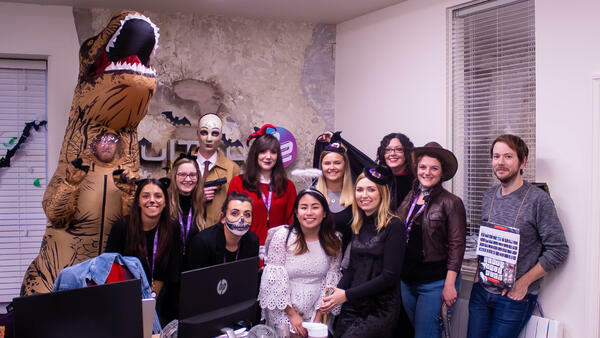 Hopefully, we’ve highlighted just how great it is to work at Digital 22. We’ve continued to grow quickly over the last 18 months and that growth shows no signs of slowing down. Check out our list of current opportunities now to see if there’s any relevant to you. Come and join our fast-growing company! Your salary will be reviewed annually and you'll be given regular pay increases to match market rates. If you have specialist skills, then you're paid above the market rate and you're able to earn more by advancing quickly. When Digital 22 does well, you share in our success and you'll get to work on amazing projects alongside talented people. We’re currently looking for Web Developers, Inbound Strategists and PPC Marketers to join the team. If there’s no position that interests you, make sure to submit your CV for us to keep on file. We’ll get in touch if an opportunity opens up that you’re perfect for.